Millets are a group of highly variable small-seeded grasses, widely grown around the world as cereal crops or grains for both human food and fodder. They are the power house of fiber, calcium, minerals & iron. It is gluten free & rich in calcium, fiber, protein and minerals.It has high nutritional values when compared with rice and wheat. Millets are called as miracle grains or wonder grains. It is a great food for people looking for weight loss, diabetic and cardiac patients. Let’s see some of the amazing health benefits of Millets here on this page. Millets are generally rich in Protein, fibre, calcium, iron & Minerals especially magnesium,copper & phosphorous. As they are alkaline, can be digested easily. Millets helps to reduce cholesterol,lowers blood pressure & It helps in the development & repair of body cells & tissues. It helps to lower the risk of Type 2 Diabetes especially for women. Its high insoluble fiber helps to prevent Gallstones formation. 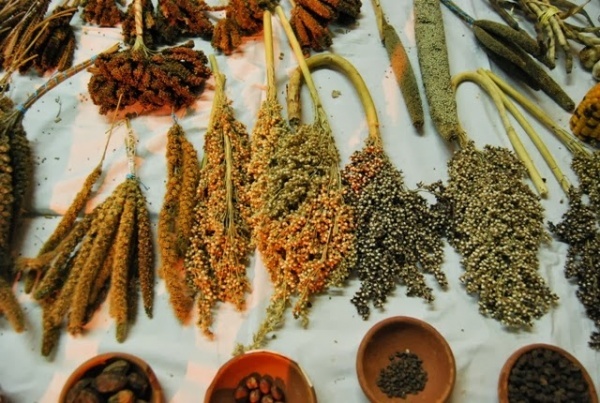 Pre-menopausal women eating Millets have a reduced breast cancer risk. Health Benefits of Millets: Minerals such as magnesium in the millets help to reduce the effects of migraines and heart attacks. In case of Jaundice, certain varieties of Millets like Finger Millet and Barnyard Millet are excellent. Millet is a smart carb with lots of fiber and low simple sugars. Because of this it has a relatively low glycemic index and has been shown to produce lower blood sugar levels than wheat or rice. Millets are useful in preventing cardiovascular disease and are beneficial in anti-ageing, nervous system and in strengthening bones. They hydrate your colon to keep you away from being constipated and also from ulcer or colitis. There high protein content makes them a substantial addition to a vegetarian diet.